What does it take to open both heart and home to a dog that needs a place to stay until he or she is lucky enough to find a forever home? To earn the prestigious title of Foster Mom (or Dad! ), one must be strong enough to love the dog as if he or she is your own and then say goodbye when the time has come. Unless, of course, you decide that foster failure is totally cool. We think so, too! I owe the happiness I experience with three of my dogs to foster families. Without them, who knows where they would be today? They were fortunate to find a safe and loving home while they waited for one they could call their very own. For that, I'm eternally grateful. Fostering one dog may not change the world but for that one dog, life will have changed quite literally forever. 5. You're saving two dogs by opening up your home to one. By providing one foster dog a safe place in your home, you are opening up another spot within the rescue or shelter for another pup to stay while he or she awaits a foster or forever home of their own. 4. You will restore a dog's faith in humanity and life itself. When you foster a dog, you're not just providing a much-needed roof over his or her head. By socializing with your foster dog and giving him or her someone to believe in, you are opening your foster dog's heart and teaching him or her to love again, regardless of what life before you might have been like. 3. You will learn a little something, too. No two foster dogs are alike. Each have very distinct personalities and, more than likely, the dog you foster may come with some traits, habits or health/behavioral quirks you may not have encountered before. Some will teach you a thing or two about patience - if you don't already have it - and others will remind you of the importance of expressing gratitude for the simple things in life daily. 2. You're giving back in a very big way. Most people want to make a difference in life, no matter how big or small the gesture, whenever possible. Some donate funds, others donate time and talent. Still others, open their hearts and homes for foster dogs in need. The bottom line: they give. And to quote some famous person (not Winston Churchill, apparently), "We make a living by what we get, but we make a life by what we give." 1. Your world (and the dog's) would be a happier place. Let's face it: it doesn't take much more than a safe and loving home to keep a dog happy. Where there's a happy dog, there's an even happier Foster Mom or Dad. Even research tells us that pets can improve overall well-being. Knowing you're making a difference is rewarding in and of itself. Knowing that your foster will never forget you for what you did makes the whole experience priceless. Just ask my three and their foster families. So...have I convinced you to open up your home to a foster dog yet? If so, be sure to check out our friends listed below. Know of another great Scottie rescue that may be in need of foster Scottie Moms and Dads? Let us know in the comment box below. Can't adopt or foster right now? 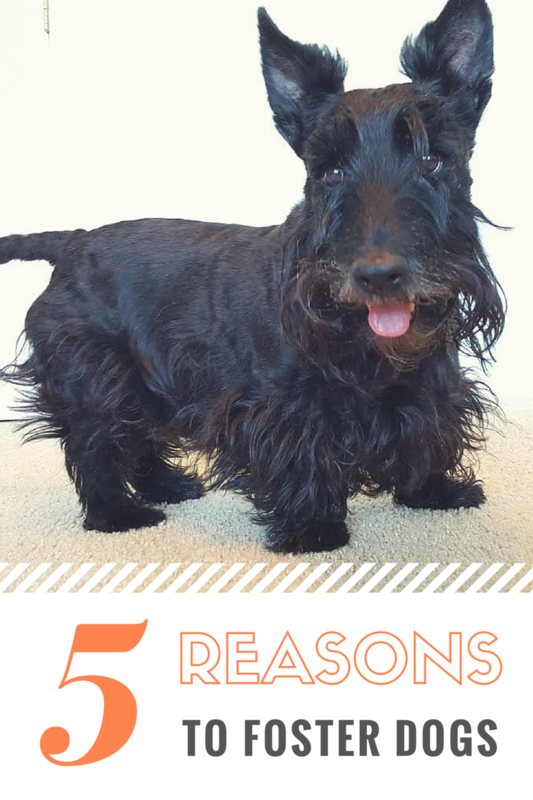 Consider making a donation to help cover the costs of caring for Scotties in need. Together, we can save the world...one (Scottie) dog at a time! I wouuld love to foster a scottie, but I'd never be able to give him or her up! I'm a permanent home waiting to happen!! Are you kidding me???? There's a lack of Scotties here, not a lack of willing foster peeps. My peeps would like to foster a Scot (both Kaci-non Scot and I-Scot) are rescues. I also would like to foster a Scottie but could never give them up I would have to keep them all. But here in this part of NY no Scottie's to be found only a few that already have a forever home . But I would love another wheaton sometime in the near future and would hope for a rescue!! !Thanks for all you do. They are all volunteers and do it all for the love of Scotties. Do what I do, just bring them home, love them up, your spouse will come around once they meet them. Just think of the good you are doing, you are giving a Scot that was other wise thrown out by the curb like trash, a chance to know what it is like to be loved by someone, be part of a family, to sleep in an actuall bed. It is hard to pass the along to someone else when the tome comes but it is wonderful to know you had a part in changing a Scots life. Remember it is always best to ask for forgiveness than permission. The TN Scottie Rescue is DESPERATE for Foster homes right now, we have two at the Ashland Terrace Animal Hospital in Hixson,TN being boarded now that are ready for their forever homes, if you can foster or would like to adopt please contact Ginger at TN Scottie Rescue. We were blessed to be part of rescuing 12 scotties last year. It is hard to hear scottie loves say they just can't or couldn't. If you don't step up and help you will be missing out on FREE scottie love! Just sayin'... go to www.scottierescue.com and HELP OUT! Alabama Scottish Terrier Rescue is looking for foster homes for Scotties coming into Rescue very soon. Check out our Facebook page and contact Frances Nelson if you are willing to foster. Thanks. I live in South Western Pennsylvania and have a scottie. I would love to help and foster a scottie .....any idea who to contact here in P?A? Roxy came to us from a foster home. SHE'd love to foster, but our house is a bit full at the moment. Scotties are rare AND expensive here, so luckily there are VERY few that ever need rescuing. Shelby came from a foster home. It was iffy for a while if she would be given up by the foster. Thankfully, she was and has been a part of the household for 5.5 years. Thank you so much for posting this! I foster for Aberdeen Scottish Terrier Rescue in Washington State and it is such a rewarding experience. Plus, my pups love company!